Resin Grill Weave Pattern Discounts Apply ! These decorative wall vent covers have a weave pattern that creates a unique 3D effect. The return air grilles are also made of a special plastic resin, making them durable and rust proof. 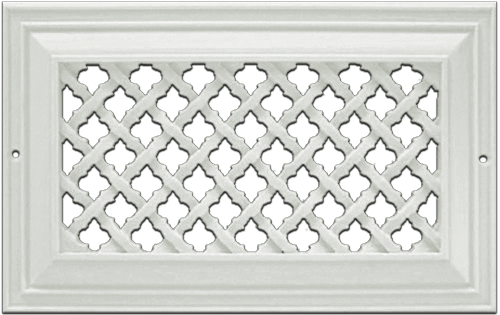 Moreover, these decorative wall vent covers are handmade in the USA, meaning that the return air grilles are all hand crafted by skilled tradesmen. The resin used to make these decorative wall vent covers is a high density, low VOC polymer. This allows the wall or ceiling return air grilles to be environmentally friendly to manufacture. Due to the density of the resin, the decorative wall vent covers are resistant to moisture, cracks, insects, bacteria, corrosion, and more. If your return air grille needs exact screw hole placement for ceiling or wall placement you can order the decorative wall vent covers without screw holes, allowing you to drill your own. When drilling screw holes the resin will react much like wood reacts. If you order your return air grille with screw holes the mounting hardware will be included. Do you need decorative wall vent covers that you can open and close? Dampers are available and will turn your return air grilles into adjustable decorative registers for the ceiling or wall. Dampers must be ordered at the same time as the resin vent covers. These grilles are made to order and cannot be returned or canceled. 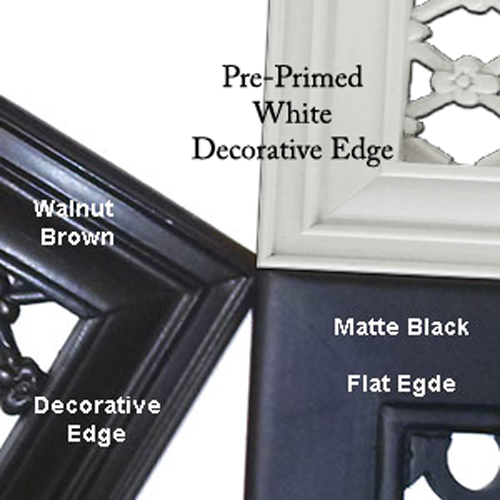 Decorative wall vent covers are listed for the hole size they are made to cover. For instance, a duct hole that measures 12" x 6" would need a 12 x 6 return air grille. The total dimensions of the grill will vary based on size but are approximately 1" to 3" larger than the listed size. The lead time for this item is 2 to 4 weeks to be manufactured. Take a look at all of the designs offered. With these return air grilles you can achieve a truly unique 3D effect, sure to impress your guests.